Carol Francis Rinehart, born Jun 24 1922; died Jun 24 1922. Doyle Leroy Rinehart, born Jun 28 1924, Iowa; died Jul 7 1980; married Betty Louise Bell, Jun 2 1945 (children: Barbara and Susan Rinehart). Donald Ray Rinehart, born Apr 15 1927, Iowa; married Willa Grace Hahlbeck, Apr 13 1952 (children: Don, Lisa and Ken Rinehart). Marjorie Lois Rinehart, born Oct 24 1930; married Francis Ardean Dunham, May 14 1950 (children: Greg, Doug and Bob Dunham). 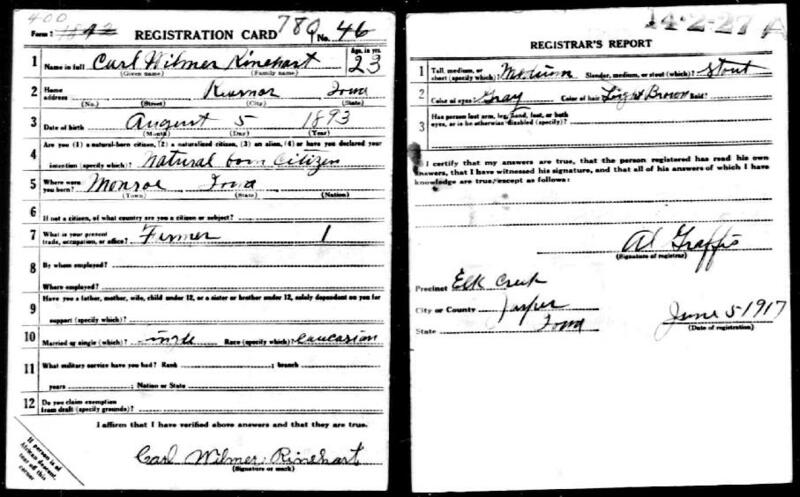 Rinehart, Carl W., head-of-household, age 36, born in Iowa; parents born in Iowa; first married at age 27; owned home ($850 value); no radio in home; occupation: laborer, general farm; World War I veteran. Rinehart, Marie L., wife, age 26, born in Iowa; parents born in Iowa; first married at age 17. Rinehart, Doyle L., son, age 5, born in Iowa; parents born in Iowa. Rinehart, Donald R., son, age 3, born in Iowa; parents born in Iowa. Ancestry Public Member Tree by Barbara Rinehart Nalley (). Contribution from Barbara Rinehart Nalley (). 1920 census, Elk Creek Township, Jasper County, Iowa; roll T625-496, ED 21, page 4A, line #23, dwelling #78, family #78. 1930 census, Bussey, Liberty Township, Marion County, Iowa; roll T626-668, ED 19, page 3A, line #32, dwelling #54, family #54. 1900 census, Marysville, Liberty Township, Marion County, Iowa; roll T623-447, ED 50, page 12A, line #30, dwelling #278, family #280.